My Sister and I always dress up together for Halloween and this year had a hard time coming up with something to go as. We finally decided on a Paper Dolls Couple Costume. We used card board for the dresses and traced our bodies to make the shape for the dress & for the tabs. We then covered the cardboard cut out dress with wrapping paper and used construction paper to make the belt, collar, sleeves,and other decorative pieces. To attach the dress to ourselves we used white ribbon which we hot glued & stapled to the back like you would tie a bikini top on ( around the neck and chest). To finish it off we bought white tights, wigs and bloomers, wore plain colored t-shirts and made our cheeks extra pink. The total amount spent was $13 on for entire costume. 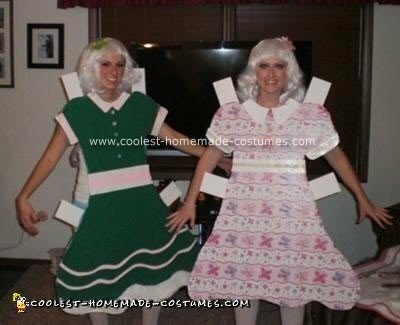 Our Paper Doll costumes were a hit at the Halloween party we went to and it won us first place for best couple. Your costumes are so cute! Neatest costumes I’ve seen in a long time! Cheap too! THANK YOU so much for posting the photo with explanation. VERY helpful. May you be blessed. I love this costume idea! Where did you find the cute bloomers?